What a week it has been for Oscar-winning screenwriter Aaron Sorkin. The Social Network scribe's upcoming Steve Jobs movie, based on the life on the late and beloved Apple co-founder's life, will open next month, but it has already caught the ire of current Apple CEO Tim Cook. 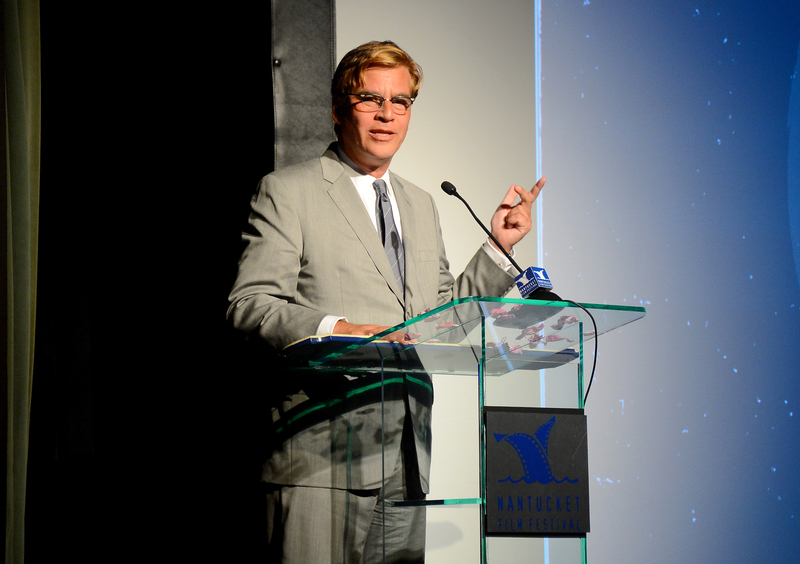 After an intense exchange of words via the media this week, Aaron Sorkin has apologized to Tim Cook in an E! News video and it sounds like he's calling it a draw. "You know what, I think that Tim Cook and I probably both went a little too far," Sorkin says in the video. "And I apologize to Tim Cook. I hope when he sees the movie, he enjoys it as much as I enjoy his products." It's good to hear these two are letting this go, especially with the movie's release so soon. Steve Jobs, starring Michael Fassbender as the famous CEO on the verge on the launch of the iMac in 1998, will be released in theaters on Oct. 9 in New York City and Los Angeles, and then nationwide on Oct. 23. Still, don't expect Cook to rush and see the movie — the feud started when, in an appearance on The Late Show With Stephen Colbert, the CEO told Colbert that he hadn't seen any of the fictionalized versions of Steve Jobs' life so far and didn't plan on it. "A lot of people are trying to be opportunistic...I hate this. It's not a great part of our world," Cook said. Sorkin responded to Cook's comments at the press junket roundtable for Steve Jobs in London this week. The accomplished writer and Newsroom creator pointed out to press that many of the film's top brass had to take pay cuts in order to complete the film, according to The Hollywood Reporter. "Nobody did this movie to get rich," Sorkin said. "Secondly, Tim Cook should really see the movie before he decides what it is." And then, the most biting comment: "Third, if you've got a factory full of children in China assembling phones for 17 cents an hour you've got a lot of nerve calling someone else opportunistic." A few days later, Sorkin issued the apology on E! News. As of right now, Apple and Cook have yet to publicly comment on Sorkin's previous remarks or recent apology. Even still, I think it's great that Sorkin was bold enough to take the first step and repent for his comments. He could've let this disagreement go on for the duration of the film's promotion, and turned it into one of those famous celebrity Twitter feuds. Instead, he took the mature route, and that's always a good thing. And who knows, maybe it'll even get Cook to give Steve Jobs a chance.